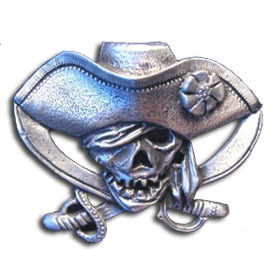 This pin is loosely based on the the flag used by the pirate Calico Jack (John Rackman) His didn't have the hat or the bandana over the eye but it did have the skull and crossed swords. It is cast in lead free pewter. It comes with two pins on the back for a very secure attachment.